This example shows how to use the SPI (Serial Peripheral Interface) Communications Library to read data from a SCP1000 Barometric Pressure sensor. Please click here for more information on SPI. The code below starts out by setting the SCP1000's configuration registers in the setup(). In the main loop, it sets the sensor to read in high resolution mode, meaning that it will return a 19-bit value, for the pressure reading, and 16 bits for the temperature. The actual reading in degrees Celsius is the 16-bit result divided by 20. Then it reads the temperature's two bytes. Once it's got the temperature, it reads the pressure in two parts. First it reads the highest three bits, then the lower 16 bits. It combines these two into one single long integer by bit shifting the high bits then using a bitwise OR to combine them with the lower 16 bits. The actual pressure in Pascal is the 19-bit result divide by 4. 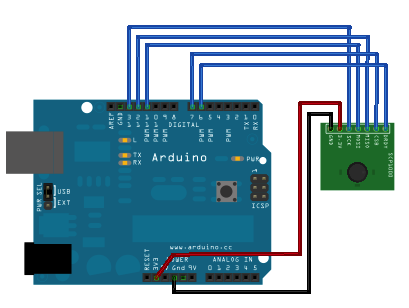 Arduino SPI LIbrary - Your reference for the SPI library. 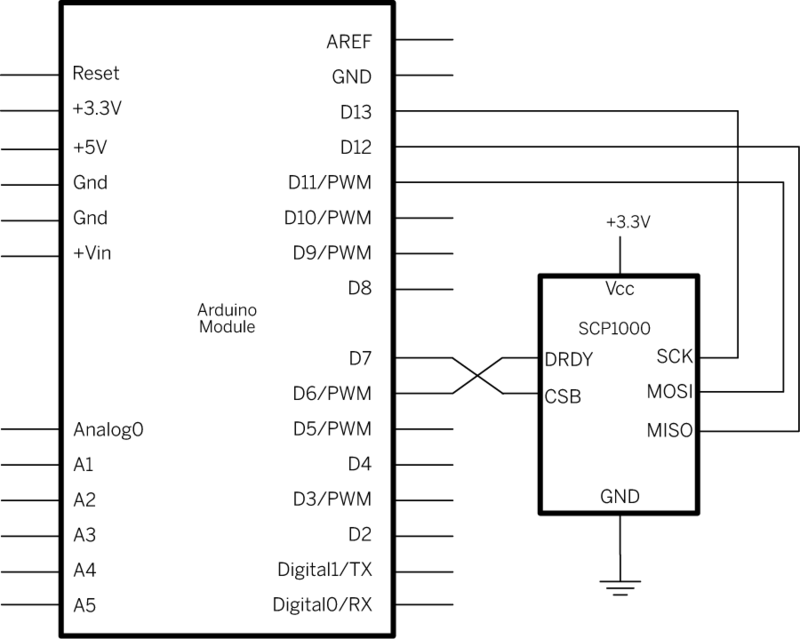 DigitalPotControl - Controlling a Digital Potentiometer Using SPI.